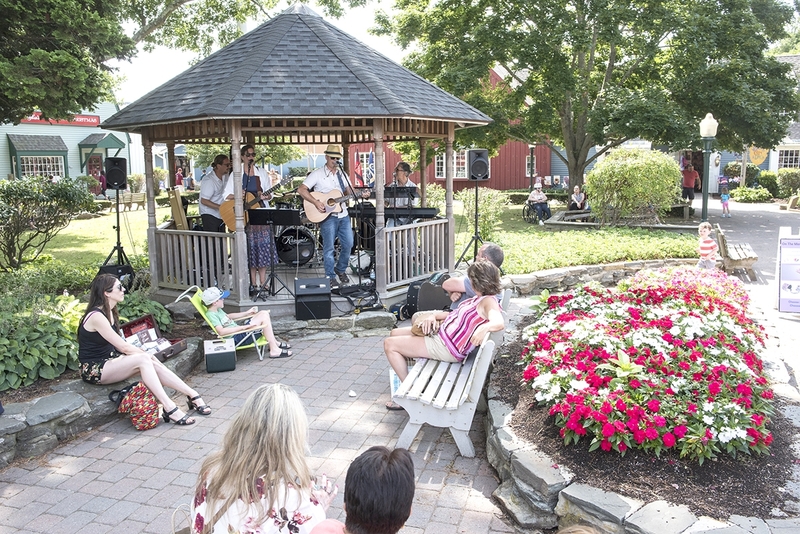 For 45 years, Olde Mistick Village has enchanted visitors of all ages with its tree-lined paths, gardens, charming shops and beloved seasonal events. And like any village, OMV is always evolving, welcoming new talent, personality and flavor. For dining out, it offers the best of all worlds, from the classic European beer hall and garden at the Jealous Monk to authentic Thai, Vietnamese, Japanese and Korean dishes at Pink Basil, to made-from scratch donuts and hand-pulled espresso at Vault Coffee/Deviant Donuts. “I knew seven years ago that we needed to get more restaurants in here,” says Property Manager Chris Regan, pointing out that the food and beverage industry worldwide has been pulling in sales of upwards of $15 trillion annually, with the forecast calling for steady growth through 2022. Brick and mortar shopping too, continues growth at 5% annually, with Americans spending 64 percent of their shopping budget in stores. Regan keeps a keen grasp on hospitality and tourism data to keep the village evolving as a preferred destination. Plans call for the renovation of an outdoor area with expanded room for concerts and other community events. It will be big – but not too big – and visitors can look forward to more of the border gardens and lovely landscaping touches that make the village magical. Nearby, workers complete the final phases of construction on the new Merrill Lynch offices, which will house 50 employees in the former Go Fish building. Go Fish is still there too, just steps away in a new space loaded with natural light and a charming outdoor deck. The venerable Steak Loft is also scheduled for remodeling, which will open the layout, add more windows, modernize the bar and add a beautiful solarium. “Everything we do here is with an emphasis on year-round enjoyment,” Regan said. With new shops and restaurants, new gifts and products, and new looks for old favorites, there’s always a reason to return. Owner Diana Blanda personally selects every item in the store, which includes clothing, tea, soaps, aromatics, jewelry and more – an interesting mixture of quality gifts and quirky items. Kimono Clips – remarkably strong accessories for thick hair – are a big seller, as are New York-made Embracelings, a one-piece wrap accessory which looks like bands of colorful bracelets. It’s like stepping into your dream kitchen, or at least every item you’d ever want in a dream kitchen. To your left, a bottle of wine sits smartly in a cut of polished granite. This conversation piece also functions as a dispenser, but the store does more than celebrate top-notch gadgetry. There are walls of traditional implements in not-so-standard styles and colors, along with gifts, linens and beautiful table and cookware. Look for demonstrations and classes to come in the on-site test kitchen. This store of children’s items for infancy to year 5 is dedicated to sweetness, softness and the art of play. There are beautiful and functional lines of clothing, endearing gifts like Solmates – which are delightfully woven, deliberately mismatched socks – and practical products like Chewbeads, fashionable accessories that can withstand a teething attack. Parents will also find fun items for every day, like glitter toothpaste to give a healthy routine that extra sparkle. Heading to a party? This is the place to bookmark. In addition to every flavor of popcorn imaginable (the dill pickle is strangely spot-on), Pop on the Block carries popcorn pizzas – fun and flavorful discs with a variety of sweet and salty toppings. The popcorn purveyor also creates customized products for favors, events and fundraising projects. It’s a perfect addition to gift baskets as well, and the seasonings are organic, so there’s lots to feel good about. Adding to the colorful offerings is Skull and Moon Mystic, a spiritual education center and art gallery founded by Sunshine Estar. This intriguing space features modern, maritime, and classic painting and sculpture and metaphysically-inspired jewelry. As part of its unique business model, art in the store can be ordered online and shipped directly to the customer – ideal for vacationing patrons, or just anyone who wants to shop without toting a large oil painting around. Sunshine makes it a point to feature diverse works by local and regional artists, from sculptures made from reclaimed industrial material, to scrimshaw, to traditional large-scale oil paintings. Skull and Moon also hosts a revolving lineup of community events for all ages, including dance nights, poetry readings, fairy-tale theater and guided meditation workshops. The shop features two psychic reading rooms; appointments can be made but walk-ins also are welcome. Services include Tarot, Rune casting, past life, past life regression, whole life readings, dream interpretation, medium work and energy healing. She’s found a warm welcome in the village and is excited to be in a space of her own. “This is a great location in a great community. Also, I’m relieved to be out of my parlor,” she smiles. The air in this boutique has the clean, sweet smell of so many plants breathing in close quarters. Bromeliad, bead plants, herbs, fruiting trees, aloes, air plants and orchids are tucked convivially into every corner of the arched space with exposed beams gracing the air overhead. Yet the effect is not crowded, but serene. Owner Annie Hettick, a longtime professional horticulturist and landscaper, makes sure each plant gets good greenhouse nurturing before it is brought to market. When Hettick opened the shop in May, she relied on Bassett’s years of experience working in Olde Mistick Village. She grew up here and remembers walking the pathways as a little girl. Olde Mistick Village is located at 27 Coogan Blvd, Mystic, CT 06355. For more information on the full range of shops, eateries, events and activities, visit http://www.oldemistickvillage.com/ or follow on Facebook. The strong, stylish kimono clips are a popular item at Smith's Boutique in Olde Mistick Village. From left, the team at Skull and Moon Mystic includes Lauren Gerrish, May Pisani, Kestrel, Justin Travers, Sunshine Estar and Jaeson Davis. Ashley Manor tucks a succulent into a decorative pot at The Plant Boutique in Olde Mistick Village.